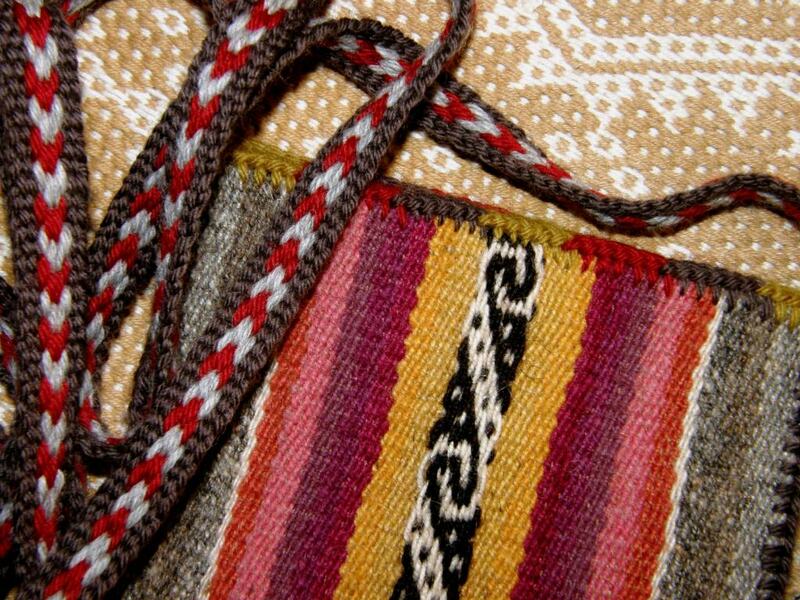 I have been working a lot with wool this week as I sew pieces of woven wool bands from Cochabamba into little pouches and dress them up with all kinds of pretty finishing techniques. 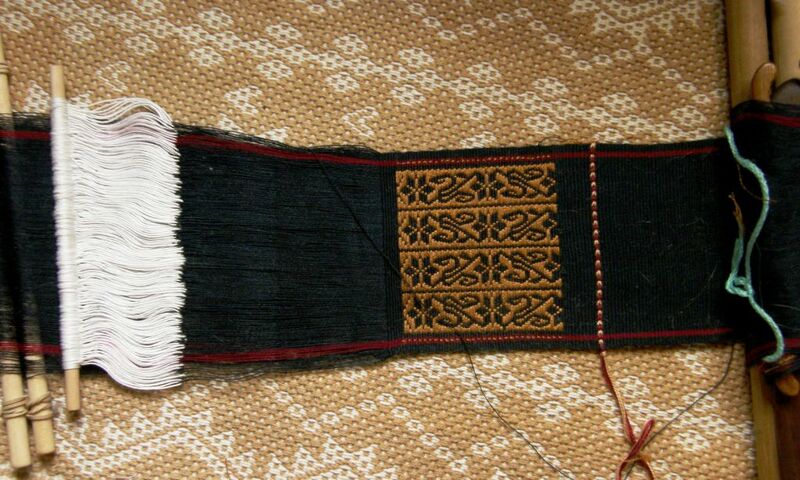 Some of the finishing stitches are easy but they require precision and doing this work increases my admiration for those who do fine embroidery work. I am using wool for my stitching thread. Working with wool is wonderful but, above all, working with wool is forgiving! This is one of this fiber’s big positive features for me. It fluffs out happily and fills in tricky spaces. Never mind if you didn’t insert the needle the exact same distance from the edge of the woven piece every single time…wool will forgive this…it has a certain rustic look that forgives even if it doesn’t always hide the imperfections. I love it. I am glad that I have spent years getting my “training” using cotton for these sewing techniques. When you switch to wool, it is all so much easier. My indigenous teachers used acrylic when they taught me these things. I added multi-color cross knit looping to the top edge of this little pouch and wove a strap. You can just see the grey cross knit looped stitch along the right hand edge. Here you can see the bottom edges of the two pouches on which I have been working this week. The one on the right has been edged with a tubular band and I added what I am calling a “coil stitch” to the bottom of the other…lots of fun to do albeit rather fiddly. I made a braid with a couple of pom poms for one pouch and added tassels to the other. 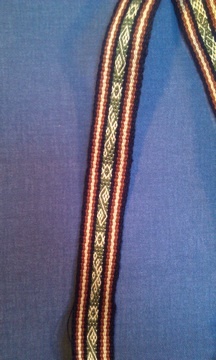 It was fun weaving the strap. I am using just regular knitting wool for these finishes and am not re-spinning or treating it in any way. It stood up wonderfully well for weaving the straps which were woven on 72-inch circular warps. 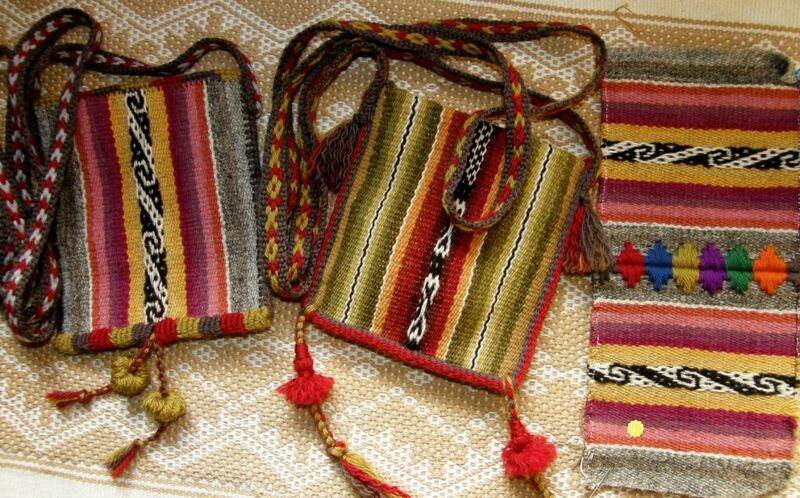 Note to the pebble weavers out there: can you see the “blip” in the pattern on the pouch on the right? The weaver used the same pebble shed twice instead of alternating them. You see, even the experts get caught sometimes! 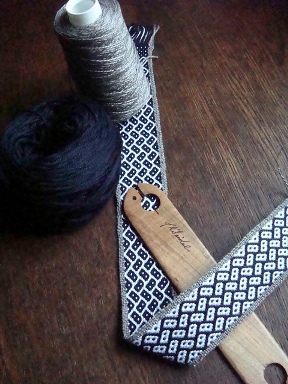 Weaving with wool, on the other hand, is a different story. It can be rather unfriendly depending, of course, on your level of expertise in preparing wool for warp-faced weaving. If not well prepared, each warp will extend its little hairy fingers to grasp its neighbor and protest loudly as you try to open a shed. Worse still, they will start to break. But, you can learn to deal with that stickiness. 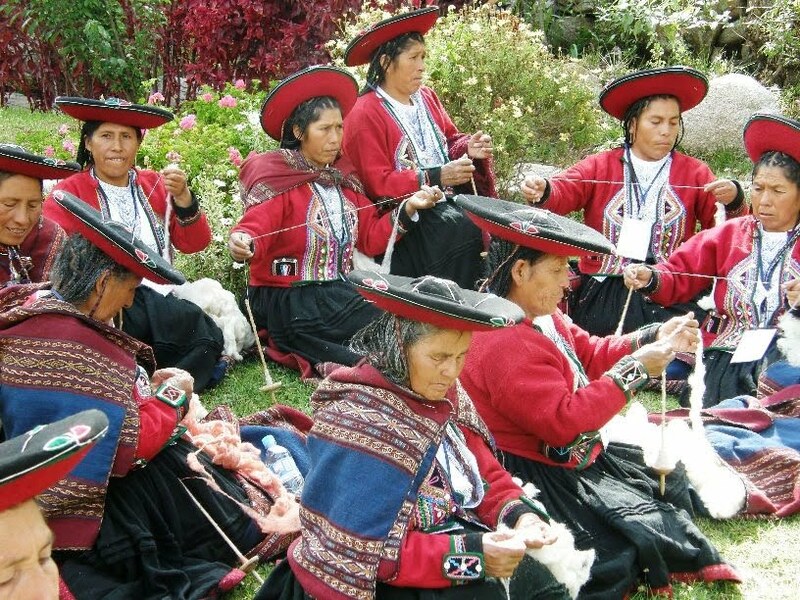 Even if you haven’t learned how to prepare the wool to the state of fine, smooth, even, perfection like the spinners in Chinchero do, there are strategies for dealing with those sticky warps. It can slow things down, and I guess you could call this one of this fiber’s negative aspects. The results, however, are always worth the effort. 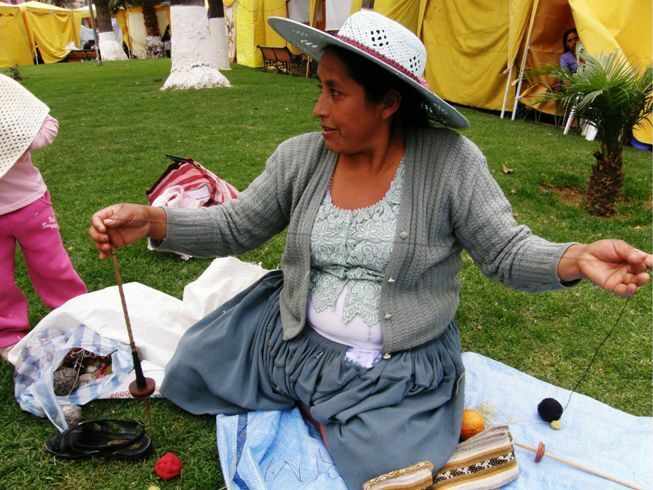 Maxima in Cochabamba adds extra twist to her hanspun yarn before winding a warp for a pebble weave band. 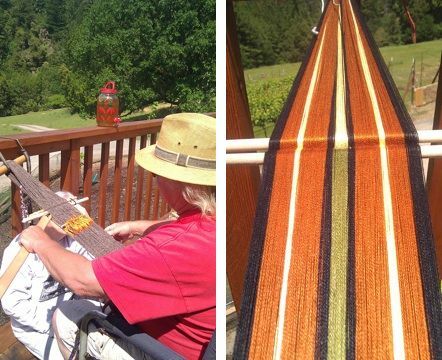 Speaking of beauiful handspun, Janet, Ace, Connie and Gina from the Humboldt backstrap weaving gang got together at Ace’s place in amongst the gorgeous redwoods for a weave-along. It was a chance to practice among friends and lend a hand to those with a little less experience. Janet and Connie helped Gina and Ace remember how to make string heddles. Ace is working with his own handspun wool and Gina is using Tahki Cotton Classic to make a backstrap. Janet gave Ace tips on how to handle the wool warp and open the sheds smoothly. Janet and Connie worked on pebble weave projects. Janet, of course, is using her handspun while Connie used 8/2 tencel to make the lanyard for her name tag for CNCH (pictured at left). I imagine that must feel gorgeously silky in that tencel. And there they were on Ace’s balcony with their warps attached to the railing calling me to join them from Bolivia via Skype! How cool is that? Above you can see Ace with his wool warp and freshly installed heddles next to Connie’s latest tencel warp…yummy colors! 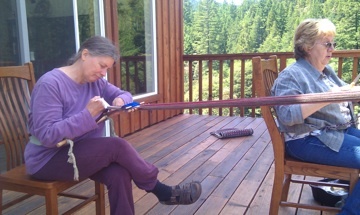 Janet gets to work on her wool warp while Gina installs heddles on her cotton one. I love that this group is finding time to get together and do this and support each other and I hope that they Skype me every time! Back at my own loom, I have been sampling supplementary-weft inlay while playing with positive and negative spaces. I showed you in the last blog post how I want to try covering the negative space on a band with supplementary wefts leaving the ground weave exposed to form the motif. So, I have been sampling away and have made some useful discoveries about the changes in weaving width that happen when you do that. This will be something to keep in mind when planning bigger projects later. I have to say that I am loving the way this looks! I am using the 60/2 silk on the Guatemalan cotton warp. I think I will still try to sew this in to something despite the width inconsistencies. I will just keep on sampling and see when I am done what can be made with it. I am keen on dressing it up as I did the wool pouches but I will use cotton instead of wool for that. I continued and added a bit of “positive” pattern just to compare. 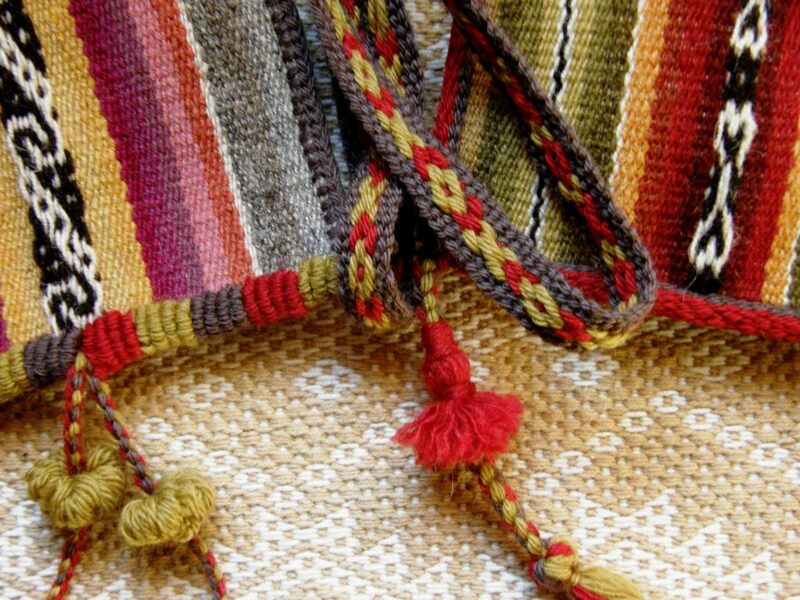 Now I would like to adapt some Andean warp patterns where both the positive and negative spaces form the same motif and weave those with supplementary wefts. There are certainly many of those to choose from and I am sure that I can find many on textiles from other cultures too. 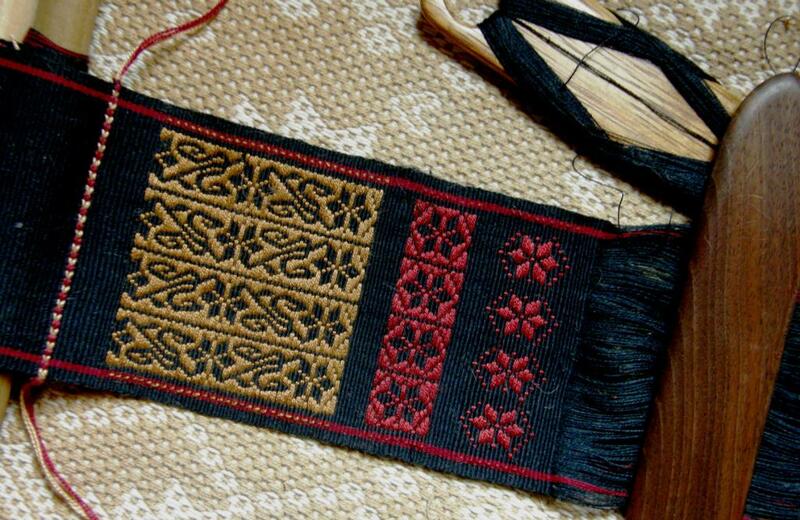 If you are not sure what I mean, take a look at the motif at left which is from the edge of a belt woven and used by Russian Old Believers. I will leave you this week with a couple of pebble weave projects. Larisa has been writing to me via my Andean Pebble Weave Facebook page and sent me pictures of her first pebble weave band using some of the 4 rev patterns from my first book on a wider band. I like the way the hearts look with the border around them. She is going to use this band as the tie for her end loom bar. And Julia continues to adapt traditional Japanese embroidery patterns to pebble weave. She uses the spotted charting system that I show in my second book to sketch the patterns ready to be woven using the pebble weave structure. Inspiring! Background, pattern, positive and negative spaces merge into a spectacular pattern. Great post – beautiful bands! “Wool is cool” should rhyme! Thanks Jennifer. 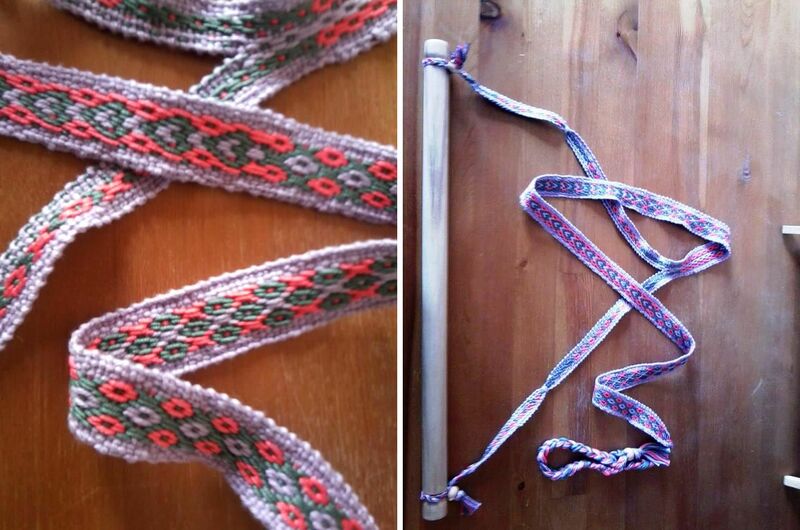 That knitting wool yarn was perfect for weaving the straps and stood up wonderfully over a 72″ warp. Your edge finishes are very inspiring. My last piece won’t work as a Backstrap, I messed up both ends of the warp. And it’s a little wimpey for a strap anyway. I think it would make a perfect small bag or two. Thanks for the ideas! Never mind…re-purpose it, as you say.I am sure it will make a couple of very cute pouches and you can dress them up. That weaving session at Ace’s was a blast. Unfortunately, Ace’s warp yarn was a lesson in yarn not to use for weaving. If he made it through the weaving he will have a nice, wide, cushy backstrap. But we helped him open sheds by standing by and pulling threads down. Pam ended up sitting under the warp helping him pull warps open. He also didn’t have a good tie up to the rail, and not real good hold on the bar at his waist, so there were a couple of times that he lost it. But with Pam’s help, it will probably be possible for them to finish it. I hope. I’ll have to work with Pam and Ace on spinning more appropriate yarns for warp faced weaving. Take a look at those photos again, folks, and see what a gorgeous place it is. You can see a little bit of Ace’s vineyard. Connie’s lanyard band is beautiful. The picture is a little bit washed out. I really love the Julia’s bands with the Japanese patterns. Wouldn’t that make a great guitar strap? Yes, I was wondering about Ace’s yarn knowing that he hadn’t spun it with backstrap weaving in mind. I hope it doesn’t put him off backstrap weaving. I could see that his far loom bar was looking a little iffy and askew. I do hope that his handspun doesn’t go to waste and that he can make it through this project. I think doing session for spinning for warp-faced weaving is an excellent idea! Go for it! Julia’s band is beautiful! Wonderful use of patterning. Laverne, I too like supplementary weft weaving and was wondering how the floats are when weaving using the negative space instead. Do you get longer floats? Do you need to be more selective in the patterns you choose? It was great skyping with you Tuesday. Thanks again for your inspiration! You do need to carefully select the pattern you use when you are filling the negative space, Connie, to avoid having long floats. You need to think about the purpose of your finished piece and how vulnerable long floats might be to getting caught and pulled on things. You need to decide how long is “too long” and then see how many warps a weft will span in order to be too long. I had to add some bits around the flower head to tie down weft floats that would otherwise have been too long. It doesn’t interrupt the pattern. So, sometimes you can adapt a pattern that way. Looking forward to Skyping with you all again during your next get-together. Thanks for taking and sending me the pictures. All of those delightful edge treatments in wool are so much fun! And I am so happy to hear they were all done in commercially spun wool. Your new supplementary weft project is so elegant. Just beautiful. Yes, Julia, even the long straps were done with knitting wool which I didn’t re-spin or treat in any way. I’ll show it to you when we meet up. I am really looking forward to it, Laverne! A friend gave me LOTS of her old wool yarns and I would love to use some of it in these ways.